Article published in Metalsmith, Issue 35, January 2015, the Society of North American Goldsmiths quarterly publication, written by Marjorie Simon. For more than 20 years, British artist Helen Carnac (b. 1968) has created expressive objects in steel and enamel at her studio in London. Parallel to this production, she has worked for many years as a teacher, author and curator, communicating her ideas about the content and origin of art. A recurring theme for her is movement, and it comes particularly to expression in her latest project, which involves collaborating with a dancer. The result is a symbiosis of installation and performance art. 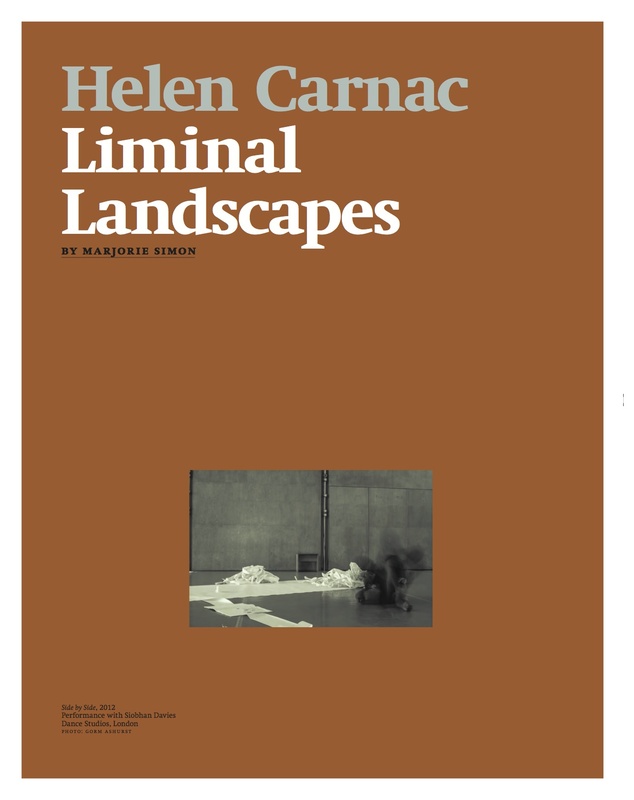 The most striking aspect of Helen Carnac’s artistic career is her development from being a studio-based, object-related artist to an actor who also does research and communicates connections within the field of visual art. Helen Carnac’s objects may seem to the uninitiated like steel bowls with enamel décor. They have a form and size easily associated with serving bowls, but their surface expression is indisputably expressive and incites viewers to seek a different experience of them. The unfired enamel is disrupted by incising and drawing lines into the surface and areas are scraped away to reveal the steel below. The vitreous enamel, when fired, is fused to the surface of the steel and becomes a new surface. The expressions are largely abstract, normally simple, almost strict, yet nevertheless always imbued with something lively and vibrating. The artist herself considers the bowl form as a three-dimensional surface on which to ‘draw’. She has always been interested in drawing and while making the bowls, also draws on flat paper. ‘I’m concerned that the firing of the enamel shouldn’t be the last stage in the process. Quite the opposite: the most central and time-consuming process is after firing. Areas of the panels are ground and abraded to a matt finish in places, allowing the steel substrate to oxidise naturally. I monitor the process very carefully and know what I’m looking for.’Carnac explains that this process, in principle, is identical to an old glazing and drawing technique called sgraffito. After she finishes the ‘drawing’, she submerges the object in water to speed oxidization. The expressiveness in your objects can sometimes bring to mind a ceramic expression. What, in your opinion, is the difference between enamel and ceramic glazing? Enamel work has long been absent from the art scene, after being regularly practiced in the 1950s and ‘60s. Is enamel now on the cusp of re-entering the craft art scene? Parallel to Carnac developing an awareness of the relation between two and three-dimensional surfaces, she also changed her exhibitionary mode. Initially her works were exhibited in gallery spaces in traditional ways. But it eventually became more important for her to exhibit drawings alongside the objects, even though the gallerists were only really interested in the objects. In recent years she has also begun incorporating found objects in her exhibitions. ‘I realised I wasn’t thinking enough about what I was doing. I had become a technician of my own work. Indeed, I was making my own works, but they were only to a limited extent the result of a reflective process. I became restless and toyed with the idea of returning to school. But I already had a higher degree, so I chose the opposite: I started teaching. This brought me back to an environment of learning, and I had to start reflecting over what I was doing as an artist.’How did it go then with your own artistic practice? In 2006 Carnac took another important step to gain greater insight into her artistic practice. She co-convened a conference called Carry the Can. It was about creating different fora for discussing ethical issues related to the trade in metals. For Carnac, this was the first of a long series of projects involving reflections on art. Another example of this development was the 2007 exhibition Process Works, which she co-curated and was about artistic processes coming into being; whilst the 2009 exhibition Taking Time: Craft and the Slow Revolution, developed ideas on the relationship of philosophies shared between Contemporary Crafts and the Slow Movement. In 2010 Carnac was awarded a Cultural Leadership fellowship to develop ideas about out how artists can create changes in society, and in 2011 she led a 4 month walking project which addressed the slow processes of change in Berlin. Carnac’s interest in process and movement eventually resulted in her being asked, in 2012, to participate in a project with the dance company Siobhan Davies Dance. She did a six-week residency with the dancer Laïla Diallo, where the intention of the dance company was to test and develop ideas for an archive that would document artistic processes and how artistic works emerge. The two artists worked side by side and engaged in an intense exchange of ideas and thoughts. With this as the point of departure, Carnac and Diallo developed visual and making expressions for their emergent ideas and impulses. Because the project was about creating an archive of the resulting experiences and knowledge, a core aspect of the work was that the process was documented. The dance company brought in a photographer to do the filming and still photography. Eventually he also became an integrated part of the project. After each week, they shared the results with the public – a ‘sharing’ that was also filmed. When the six weeks were over, the two agreed to continue collaborating. They started a new project that is still ongoing, called Edge and Shore: Acts of Doing. This work is somewhere on the boundary between installation and performance, yet falls into neither category. It’s become difficult to explain in words. But like most of my artistic practice, it’s about moving things around.It can seem like the projects you’ve done alongside your ‘regular’ artistic production largely have to do with studying chaotic processes and states of being. Could you say a little more about the relation between chaos and control in your art? Earlier you said you know exactly what you’re looking for when you work. Is it this ambivalence that is the common denominator for what you seek?